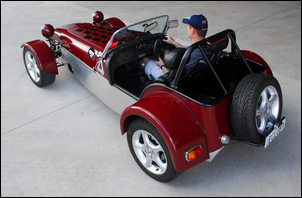 Mark Fowler has built himself an electric sports car. The IT professional has done what many people dream about but few seldom achieve. The car’s based on an off-the-shelf kit Clubman, but Mark has added an electric motor, control gear and batteries. The Birkin PRB S3 Clubman uses an epoxy-coated steel frame fitted with aluminium panelling. 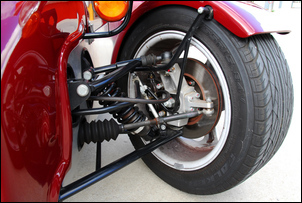 The rear suspension comprises a solid axle located by four trailing links and a Panhard rod. Front suspension uses unequal length upper and lower wishbones, an anti-roll bar and coil-over dampers. Brakes are discs front and rear, with four-spot front aluminium calipers. 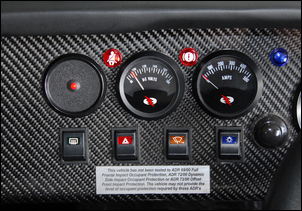 Steering is non-power rack and pinion, and the kit also includes an adjustable aluminium pedal box. But of course it’s the non-standard parts that are the most interesting. 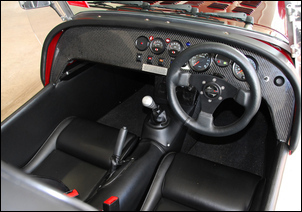 The underbonnet scenery comprises a clear plastic panel on which are mounted a throttle position potentiometer connected by cable to the accelerator pedal. 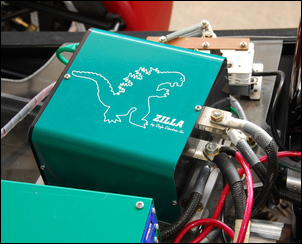 The pot talks to a 1000 amp Zilla DC motor speed controller that works with an Advanced DC ‘9 inch’ electric motor, located beneath these components. Mark says the continuous output of the motor is 20kW but that short term, it’s good for something like 100kW. The motor is bolted to a 5-speed gearbox that in turn drives a conventional tailshaft to the standard kit differential. 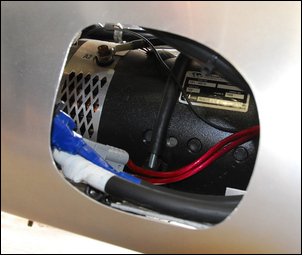 Near the speed controller you’ll find an 800 amp main fuse, and a mains-powered battery charger capable of outputting 20 amps at the full 144V battery voltage. A DC/DC converter keeps a tiny 12V SLA battery charged – this is primarily for safety in powering lights and instruments should the main battery pack need to be shut down. 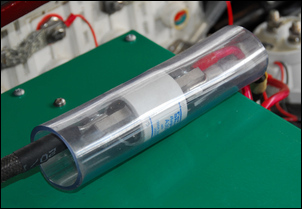 Batteries are located in the nose of the car, under the boot and (when fitted), either side of the pictured electric motor. 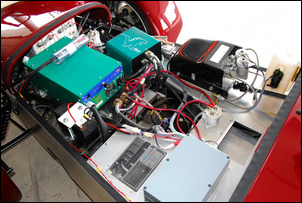 Unlike the other electric cars we’ve covered in AutoSpeed, Mark’s car uses lithium ion batteries. But in this case, it looks very much as if going to the new technology has not been the expected success. Lithium ion batteries are far lighter than lead acid batteries of the same capacity. They also have better performance characteristics in terms of being able to continuously supply high current. But the lithium ion batteries in Mark’s car have proved to be a complete flop. The first generation ThunderSky lithium cobalt designs have turned out to have an instantaneous current rating far lower than claimed. In fact, Mark told us that while the original data suggested that the batteries would be able to generate 300 amps in short bursts, the actual figure is more like 30 amps! The battery voltage also sags hugely (and stays low), the two aspects resulting in a massive shortfall in car performance. To a degree, Mark is philosophical about the battery disaster. While recently in North America he attended electric drag racers and saw what real high performance lithium ion batteries are capable of. ThunderSky also now has a new range of lithium ion batteries, and these are apparently a much better proposition. However, having already spent around $11,000 on batteries, Mark is not looking at using the same supplier. Instead, he’s considering spending $40,000 on state of the art batteries that would give the car phenomenal performance. In addition to new batteries, Mark would also like to give the gearbox the flick (he uses only 4th and reverse gears, and reverse is easily catered for by changing the polarity of the DC motor feed) and perhaps upgrade the DC motor and controller for something more powerful. But the latter’s another unknown – because even with the current motor/controller, decent batteries should give the 640kg car great performance. It all really depends on where you’re coming from. A high performance petrol engine with programmable engine management and perhaps a turbo, new fuel tank and fuel pumps, and a new custom radiator could easily tip the balance of fifteen or twenty thousand dollars. An engine with a lot of power could go much higher in cost. In this context, shelling out, say, $20,000 for a battery pack that would make the car go hard is reasonable. An all-up cost of about $70,000 for a unique car with strong performance, very good handling – and running costs of only cents a day – could even be warranted.